"At that the high priest tore his garments and said, 'What further need have we of witnesses? You have heard the blasphemy. What do you think?' They all condemned him as deserving to die" (Jn 14: 63-64). When Jesus had been arrested by the Roman soldiers, they took him to Caiaphas, the high priest. Jesus and the soldiers didn't know it but Peter, Jesus' disciple, was following them to the high priest. When Jesus arrived, the Chief priests and the entire Sanhedrin were trying to obtain false testimony, in order to put Jesus to death. They found no evidence until finally two people came up and said that Jesus said he could destroy the temple and rebuild it in three days. When the high priest rose and asked him "have you no answer?". Jesus was silent, he had no reply. Then finally the high priest demands Jesus to answer if he is the Messiah, the son of God. and Jesus says "you have said so". 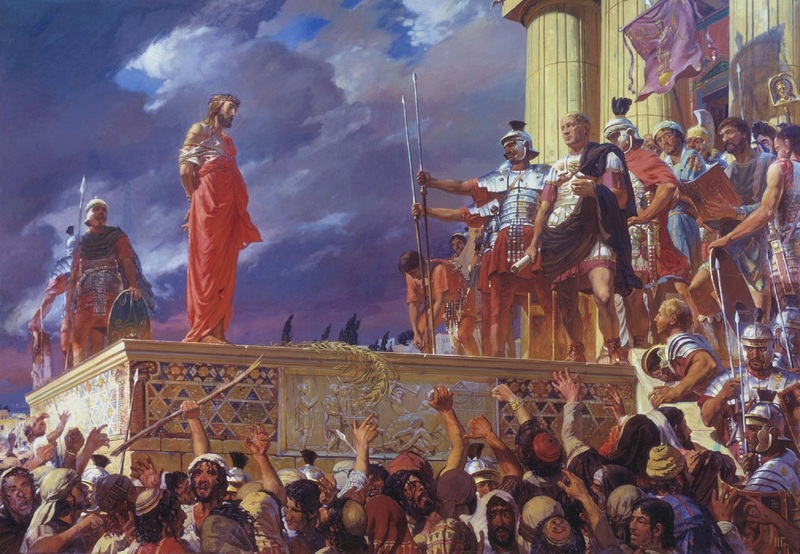 The high priest then accuses Jesus of Blasmphy and orders that Jesus shall be put to death. A point in "The Trial Before the Sanhedrin" that is only present in the Gospel of John is when Jesus was scourged and given a crown of thorns that was put on his head. Also, he was forced to wear a purple cloak and the soldiers struck him repeatedly. These details are only found in John. Similarity one: In all four gospels the crowd decides to have Jesus killed, and Barabbas the murderer let free.